Prairie Fire (215 N. Clinton in Chicago; 312-382-8300) is honoring World Ocean Day in cooperation with the John G. Shedd Aquarium 6 p.m. June 8. The event features presentations by Shedd Aquarium staff—Melanie Napoleon, Senior Director of Great Lakes Conservation and Brooke Havlik, Sustainable Seafood Educator—and an educational, all-inclusive four-course dinner with pairings for $100 per person. Award-winning chefs, Sarah Stegner and George Bumbaris, are preparing the four-course World Ocean Day Dinner with sustainable seafood in mind. The first-course will be served family-style to include Chilled Spanish Style Mussels, Corn Meal Crusted Local Perch with arugula remoulade and balsamic reduction, Homemade Bread with early summer radishes and sweet whipped butter, paired with “The Apothecary”- Death Door Gin with fresh lemon juice, triple sec and carpano. The second-course is Wild Striped Bass with spring minestrone, pesto, croutons and shaved artisan cheese, paired with Casa Silva “Cool Coast” Sauvignon Blanc—wine from Guy Comerci (Vin Divino). The third-course is Grilled Wild Alaskan Salmon with new potatoes, onions, garlic chives, asparagus and a bacon vinaigrette, paired with Morgan ‘Twelve Clones’ Pinot Noir, Santa Lucia Highlands—wine from Annica Heymann (Heritage Wine). The final dessert course is Orange Chiffon Cake with Koval Organic Orange Blossom Liqueur. Prairie Fire supports local sustainable farms; farms highlighted for World Ocean Day are Three Sister’s Garden, Nichol’s Farm and Orchard, Kinnickinnick Farm and Brunkow Creamery. Raffles prizes include Shedd Aquarium passes and the new sustainable seafood cookbook For Cod and Country by Chef Barton Seaver, just released May 3, 2011. In honor of the special occasion, Prairie Fire will be making a donation to the Marine Conservation Alliance in Alaska. To make a reservation, call Prairie Fire at (312) 382-8300. Two-time James Beard award-winner, Sarah Stegner, is co-chef and co-owner of Prairie Fire and Prairie Grass Cafe. This Evanston, Ill. native grew up in a family devoted to food, thus setting the foundation for her passionate and successful career as one of America’s most respected chefs. Stegner graduated with a chef’s certificate from the Glencoe, Ill. Dumas Pere Cooking School. She went on to build her prestige reputation at the Ritz-Carlton Hotel Chicago, establishing her friendship with now business partner, Chef George Bumbaris. Even through her impressive award-wining history, Stegner remains modest and passionate about using the best seasonal ingredients to be found. Stegner is co-founder of Chicago’s Green City Market—a weekly venue for Midwest sustainable farmers. George Bumbaris, co-chef and co-owner of Prairie Fire and Prairie Grass Cafe (along with Stegner), became instantly hooked the first time he experimented in the kitchen. After completing his studies at the Glencoe, Ill. Dumas Pere Cooking School, Bumbaris began a 21-year journey at the Ritz-Carlton Hotel Chicago. Among his many accomplishments, Bumbaris took first-place in the Bucouse D’or American Culinary Gold Cup and first-place for the United States in the 26th Prix Culinaire International Pierre Taittinger. His skills were highly reflected in reviews as he worked his way up to executive chef at the Ritz-Carlton Hotel Chicago. Bumbaris was thrilled to start a new chapter at Prairie Fire and Prairie Grass Cafe, developing a menu that is fun and accessible. Prairie Fire (215 N. Clinton in Chicago; 312-382-8300) brings the world of fine-dining to an accessible level of casual dining, using the freshest of ingredients to reflect the season. Prairie Fire supports Chicago’s Green City Market and local sustainable farms. Serving innovative American comfort food, Prairie Fire takes pride in their homemade products including handcrafted sausages, salad dressings, ice cream and desserts. 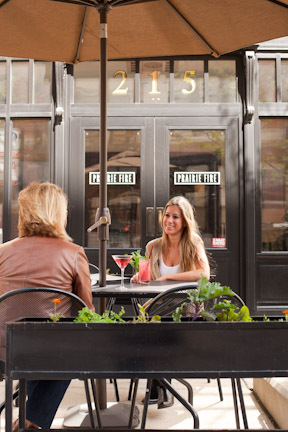 Prairie Fire is located two blocks from the Ogilvie Metra terminal and just steps from the CTA Clinton St. Station. Special offerings include valet service and private space for special events. Prairie Fire serves lunch Monday - Friday 11 a.m. to 2 p.m.; dinner Monday - Thursday 5 p.m. to 10 p.m., Friday and Saturday 5 p.m. to 11 p.m. and Sundays 5 p.m. to 9 p.m. For more information or to make a reservation, please call (312) 382-8300 or visit http://www.prairiefirechicgo.com/. The John G. Shedd Aquarium, a nonprofit organization dedicated to public education and conservation, is one of the world’s largest indoor aquariums. The facility houses over 32,000 aquatic animals, representing some 1,500 species of fishes, reptiles, amphibians, invertebrates, birds and marine mammals from waters around the word. Since its opening in 1930, the Aquarium’s mission has been to enhance public understanding of aquatic life and connect guests to the natural world, inspiring them to protect and preserve the planet.